↑ Murray, D. & Smith, A.T. (2008). 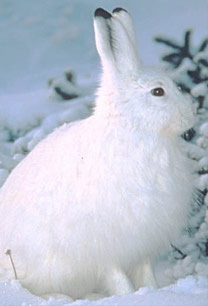 "Lepus americanus". IUCN Red List of Threatened Species. Version 2009.2. International Union for Conservation of Nature. Retrieved 01 February 2010. ↑ Hoffman, Robert S.; Smith, Andrew T. (16 November 2005). "Order Lagomorpha (pp. 185-211"). In Wilson, Don E., and Reeder, DeeAnn M., eds. Mammal Species of the World: A Taxonomic and Geographic Reference (3rd ed.). Baltimore: Johns Hopkins University Press, 2 vols. (2142 pp.). pp. 195. ISBN 978-0-8018-8221-0. OCLC 62265494. หน้านี้แก้ไขล่าสุดเมื่อวันที่ 5 กันยายน 2561 เวลา 15:14 น.